Ferns are among the oldest living plants on earth and there are both indoor and outdoor types of ferns. 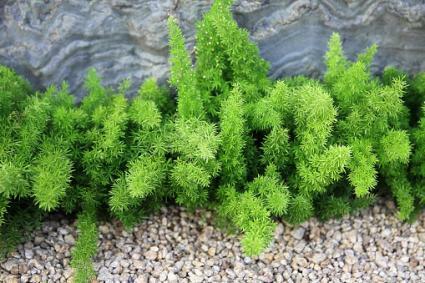 They normally have fronds (leaves) that drape and flow, adding a dramatic touch to a garden or indoor setting. 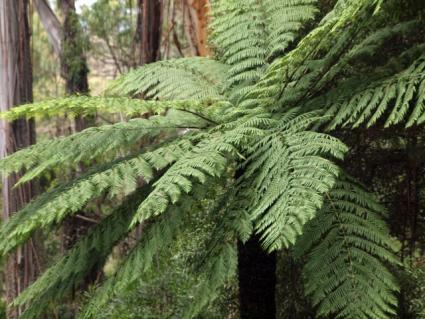 More than 20,000 known species of ferns grow around the world. 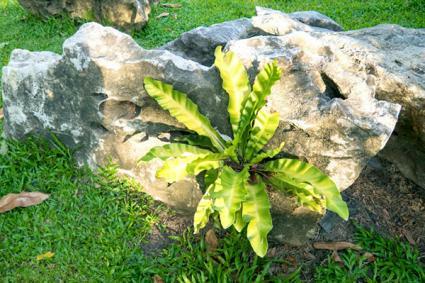 Many types of ferns flourish both outdoors and as houseplants. 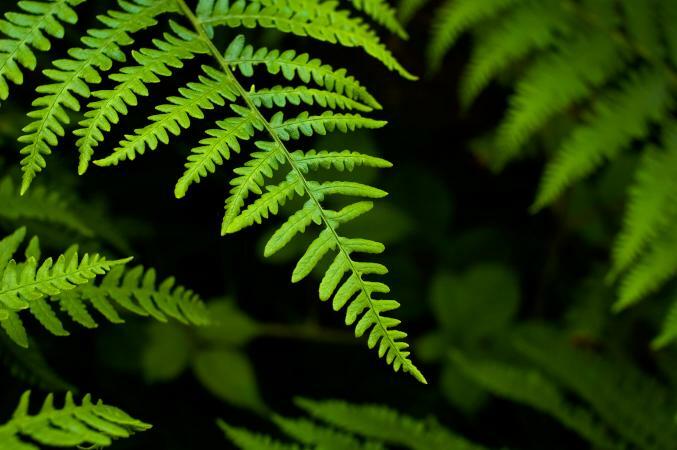 Outdoor ferns thrive best in partially shaded areas and those grown indoors flourish in bright light, provided they are not placed in the path of direct sunlight. 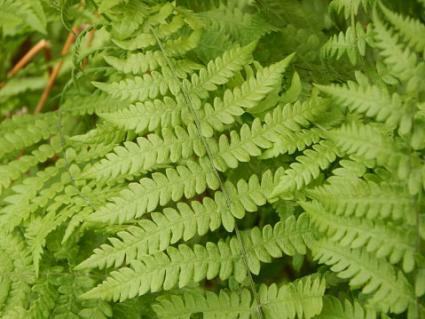 Ferns rarely suffer from diseases or insect infestations and are easily grown by even the most novice gardeners. When growing ferns indoors, choose a spacious area, as they tend to grow long leaves or fronds that shoot out in all directions. Indoor ferns are especially suited to hanging from ceiling hooks in remote corners of rooms that receive the maximum amount of light but are rarely, if ever, touched by the direct light of the sun. 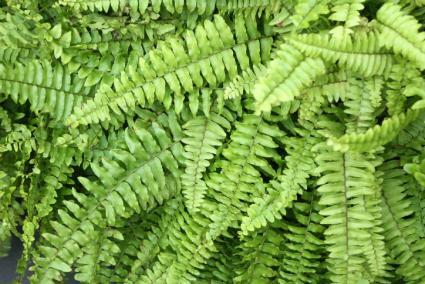 Boston Ferns: These are the most popular of the houseplant varieties, although they also grow wild outdoors in many regions. They have dark green leaves with many deep, evenly spaced indentations in the edges. Boston ferns benefit from frequent but light misting of the fronds and can grow to gargantuan proportions. Holly Ferns: This variety has three to four inch dark green leaves that resemble those on holly bushes and are heat, light and water tolerant. They are available in three species including Japanese, Hawaiian and East Indian holly ferns. 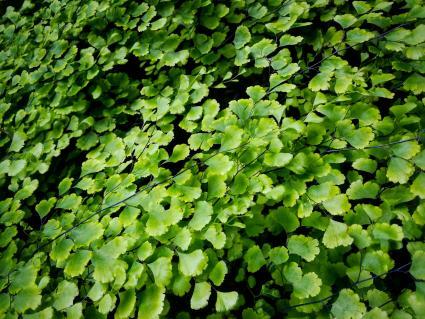 Maidenhair Ferns: As one of the most delicate types of indoor ferns, this unique plant has thin black stems and small, dainty leaves. They are a challenge to grow as they prosper best in atmospheres with high humidity but their leaves cannot withstand misting. Maidenhair ferns grow well in the corners of large bathrooms because of the humidity but cannot survive in direct sunlight. 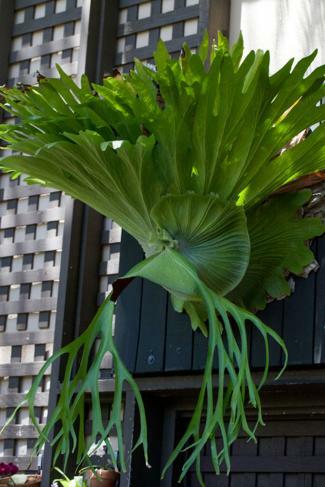 Staghorn Ferns: Although this species commonly grows on the bark of trees in Asia, Africa and Australia, it is a good houseplant if planted in a coarse soil with good drainage. The plant has two sets of fronds. The green fronds are fertile, resemble stag horns, have spores on their underside and grow up to four feet long. 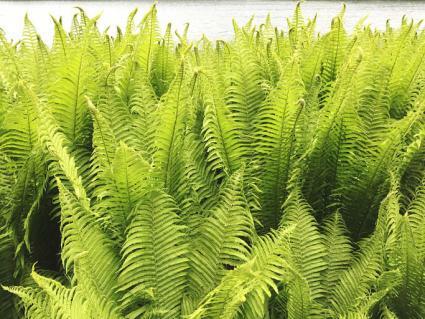 The brown infertile fronds grow outside the green ones and are short, flat and round. 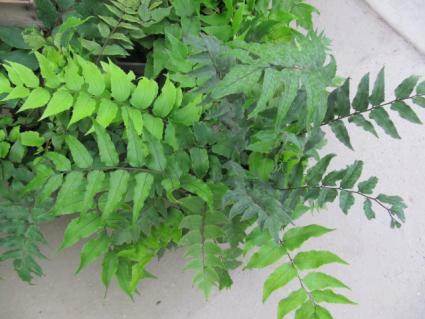 If you want to add drama to the landscape design of your backyard or flower garden, planting ferns is the answer. Ostrich Ferns: This is one of the tallest and most majestic of outdoor fern varieties, with fronds that often grow to five feet in length. The leaves on ostrich ferns grow in an upward sweep that resembles a vase. Ostrich ferns like moist soil and shade. To make them more compact, water them infrequently at ground level, taking care not to get any moisture on the delicate leaves. Japanese Painted Ferns: If you live in an area with harsh winters, this is the perfect outdoor fern for your garden as it can withstand temperatures as low as -30F degrees. 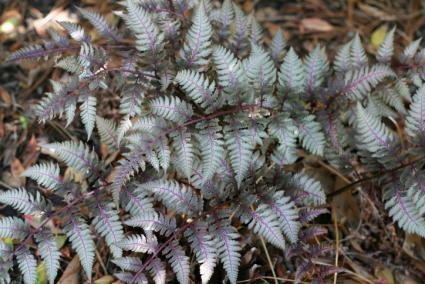 The tapered fronds on this fern are beautiful mixes of purple and silver and only grow up to 18 inches long. Australian Tree Fern: As the name implies, this plant is actually a tree that normally grows to about 30 feet tall, with eight-foot fronds and trunks around six inches in circumference. It thrives all over the rain forests in New Zealand and Australia, so only plant it in a climate with heavy precipitation and warm temperatures. Asparagus Ferns: Although there are three varieties of this fern, the most common type has fine, needle-like leaves that are irritating to the skin. They thrive well in bright light and often proliferate so well they take over entire gardens, so keep them in check with frequent pruning. Bird Nest Ferns: Bird nest ferns are like garden garnishes, as they are compact and provide a great contrast for a garden's flowering plants. They prefer shade and can grow on rocks and trees as well as in soil. Cinnamon Ferns: This fern frequently grows wild along creeks and streams, so it requires a lot of water if planted in a garden. It grows about five feet tall and has two kinds of fronds. The bright green ones are infertile and the fertile ones have a deep, brown cinnamon color. Whether you decide to plant a fern in a garden or a pot, be prepared to be awed by their beauty and hardiness. If you happen upon one that seems a bit sickly and reluctant to grow, simply snip a few of the fronds and put them in water until tiny roots form and start a new plant. Ferns are easy to propagate, so you will probably never have to buy new ones to replenish your home or garden.